Bentonville Arkansas is one of the fastest growing American towns and after spending 5 days there there’s no question in my mind why. Northwest Arkansas is not the first place I would have thought to take my family on a vacation but I left already planning my next visit to show my husband and kids all the amazing amenities this gorgeous region offers! I had the pleasure of joining Visit Bentonville as they introduced me to their beautiful town and right from the get-go I felt welcomed and almost at home as I walked around the downtown square. 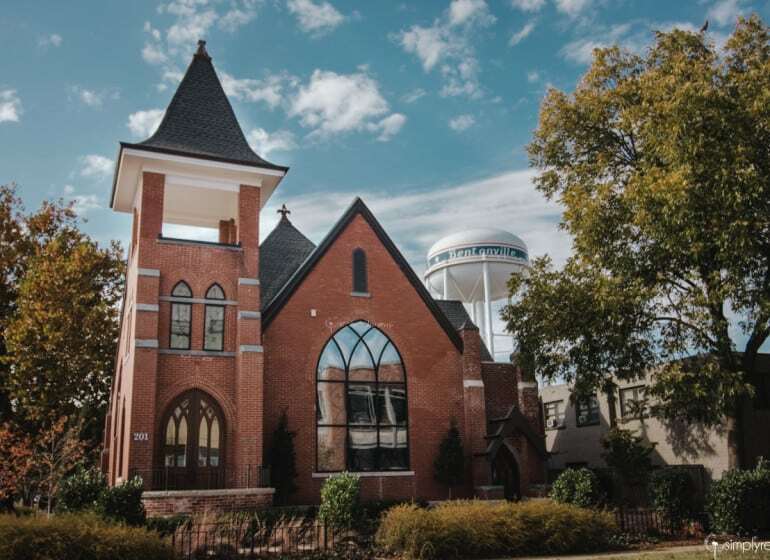 Bentonville has a squeaky clean vintage charm that is hard to find anymore, and they’ve balanced it nicely with modern locally owned restaurants and shops that offer convenience and fun all within an easy walking radius! There’s so much to take in while in town, so I wanted to feature all of the reasons I fell in love with Bentonville during my stay. This renovated church is now one of the hottest restaurants in town and for good reason. I was so impressed with every item on the menu that I tried and was pleased to find out that the Preacher’s Son is completely gluten free and Celiac safe! My favorite item that I tried? The Burrata Cheese appetizer served over shaved beets. I am not a huge beet fan but I nearly licked the plate clean with the delicious combination of the creamy cheese and crunchy sweet beets. Dinner was a lovely ribeye that didn’t disappoint either. All was delicious! For a romantic Italian inspired dinner, Fiamma is your spot! With menu offerings like octopus, duck and lobster mixed with Italian favorites like carbonara and bolognese, there’s something for any palate in your party. Personally, I chose the Parpadelle Bolognese because it was a chilly evening and I wanted some comfort food. It was absolute perfection. I was stuffed after dinner and did not regret it one bit. We went to Oven and Tap for lunch and shared an outrageous amount of delicious plates. A must try is the fried mozzarella. It was crispy and flavorful on the outside and creamy on the inside, served with a marinara. The edamame was also worth trying, roasted to perfection and almost melt in your mouth. Oven and Tap has a custom built wood fired oven, so don’t hesitate to try any of their delicious pizzas-they are amazing. This is a chain restaurant but DEFINITELY worth visiting while in Bentonville! Tacos 4 Life is not only a great spot to have quick and delicious tacos, they also donate enough funds to supply one meal through Feed My Starving Children for every meal sold in their stores! Eat good food, do good in the world-a win win! We enjoyed breakfast at the Hive, located inside of 21C Museum & Hotel in downtown. The entire building is filled with gorgeous art, the Hive restaurant included. There are bees and hives all over the walls made from recycled products and no two hives are the same-so fun to look at! The house made yogurt and locally ground grits were favorites at the table but I went with The Hive Breakfast with eggs, house made sausage and grits. I also had their skillet potatoes and those had to be my favorite that I had. I’m totally a breakfast potato kinda gal and these did not disappoint! 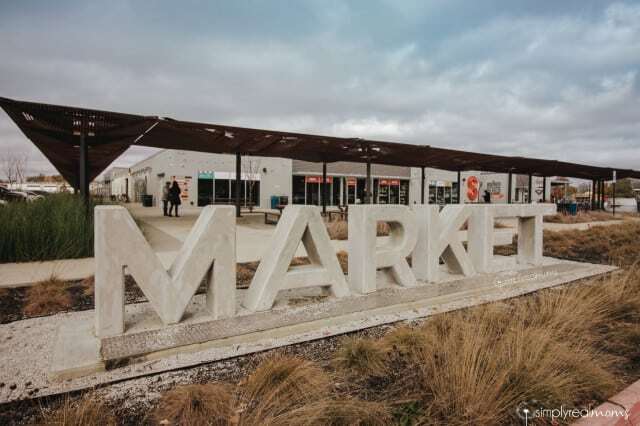 In all of our dealings with locals, one thing kept coming up: the Brown Sugar Bourbon Chocolate Chip Cookies at Markham and Fitz at 8th Street Market. Lucky for us, when we showed up to this chocolate company they were about to pull the cookies hot out of the oven! I ordered a cappuccino with Baileys (they have coffee and cocktails!) and enjoyed one of the best cookies I’ve ever had! 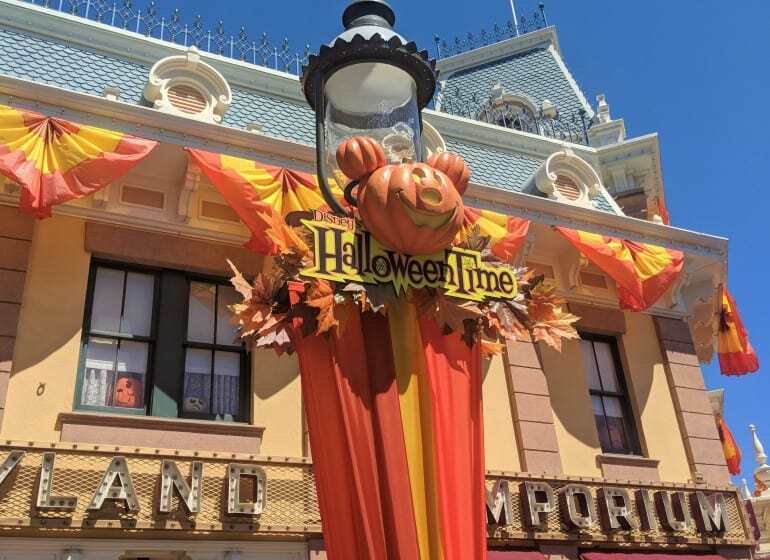 This is a MUST stop, not just for the chocolate but for the gorgeous decor as well. Another treat we were told about is the Blueberry Rolls (like cinnamon rolls but with blueberries) at Bentonville Baking Co. By the time I arrived at 10:30am on Saturday they had been sold out of the rolls for over an hour! So I chose a blueberry lemon loaf and sat with a latte and enjoyed checking out the adorable souvenirs and trinkets they sell in store. It was a great stop on my way out of town! This is a Bentonville staple. Open since 1970 in what used to be a church youth summer camp, Fred’s is known for quality food and impeccable service and that is just what we got. The ribs were fantastic and perfectly smoked and I love a good meatball-theirs were delicious! 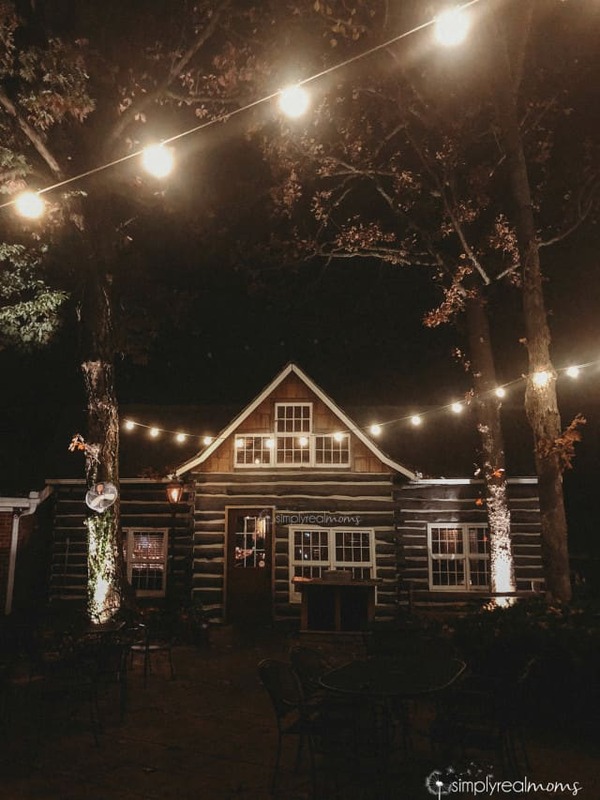 After dinner, a visit to their bar, The Cabin is a must. The Cabin is located in one of the original buildings from the summer camp and a fun rustic spot to have a nightcap. 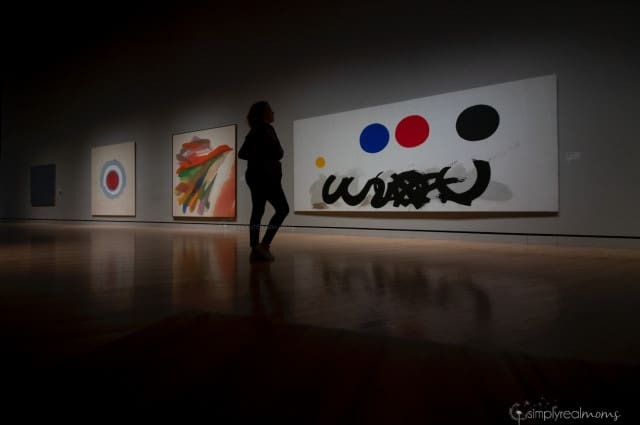 A museum is the last place I would think of to go to eat, but Eleven (named for the opening date of the museum, 11/11/11) is worth checking out! The views are incredible and the food is equally as impressive. I had the beef and barley soup along with the Eleven Burger, both were fantastic! 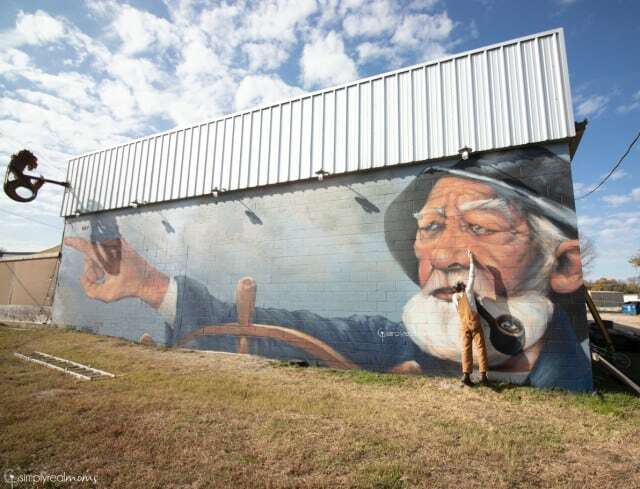 Bentonville is not only just a beautiful destination, it is a destination for art lovers of all ages. 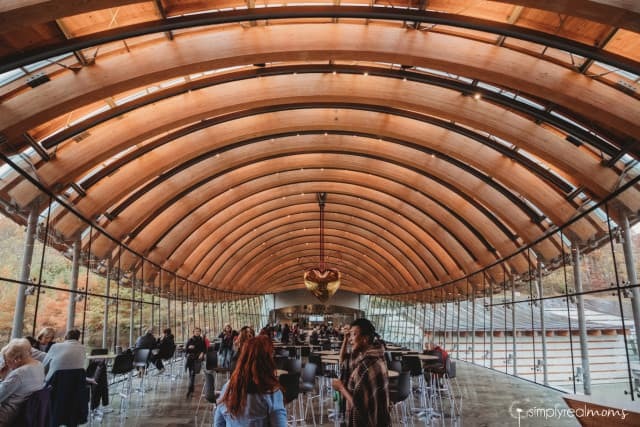 Whether you visit Crystal Bridges museum to take in the art from American history or take a walk through downtown to feast your eyes on the countless murals, you will not have to look far to find art in Bentonville. 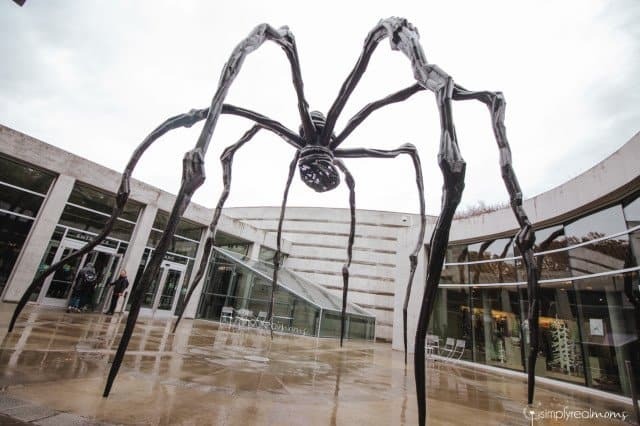 When you visit Crystal Bridges, the art inside is made even better by the art outside of the building. The building itself is a work of art with windows everywhere to let the beauty of the outside in. 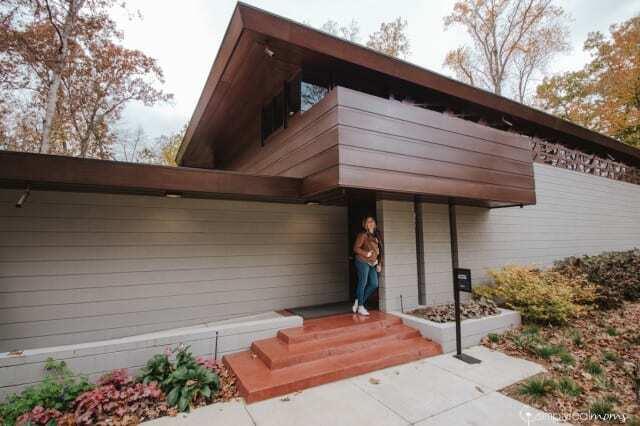 Once you’ve walked through the exhibits, grab a free ticket to go see the Frank Lloyd Wright house on the property and take in the beauty of American architecture surrounded by nature. A walk along the paths of the museum grounds and towards downtown is a delight filled with sculptures and views you can’t find anywhere else. 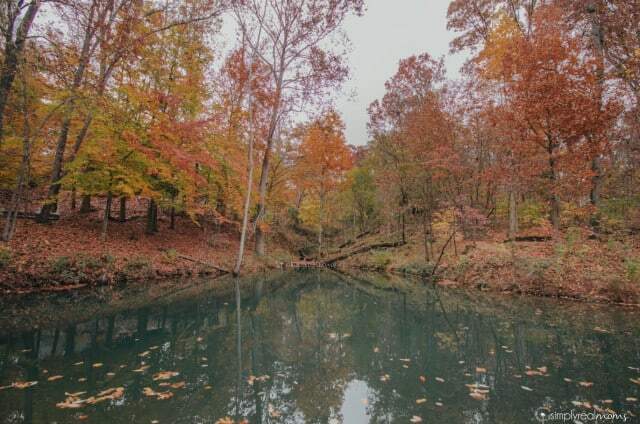 If you love being out in nature, a visit to Bentonville should be on your radar. The endless miles of walking and biking paths allow for people of all abilities to take in the surrounding beauty. Northwest Arkansas truly has four separate seasons, so weather is dependent on the time of year you come but during the chilly week in November we went, weather was just perfect for fall! Yes, I mentioned nature as the last category. Bentonville fall deserves a category all on it’s own. I have lived all over the country and have seen gorgeous autumn trees but after living on the west coast for years, flying in to Northwest Arkansas made my eyes bug out. The sheer number of trees is impressive enough but add to that the most vivid fall colors of the leaves and it’s like nothing I’ve ever seen. AND! Everyone we spoke to said something to the effect of “You should have been here a week ago, it was beautiful!” It was hard to believe it got any more beautiful than what we saw but let me tell you that if you plan to visit Bentonville, fall isn’t a bad time to be there! I’m a bit of a coffee fiend, so I tend to gravitate towards local coffee shops when I travel. When I asked locals about where to find a great coffee shop, the resounding answer was Onyx Coffee Lab. I walked in and immediately fell in love before I even tasted the coffee! This gorgeous space is probably the most beautiful coffee shop I’ve stepped into, and once I tried the coffee I knew why it is so loved in town. Delicious coffee in a shop I could spend all day in? I’m sold. We also had the chance to taste locally owned Airship coffee while meeting with the owner and his master barista daughter. 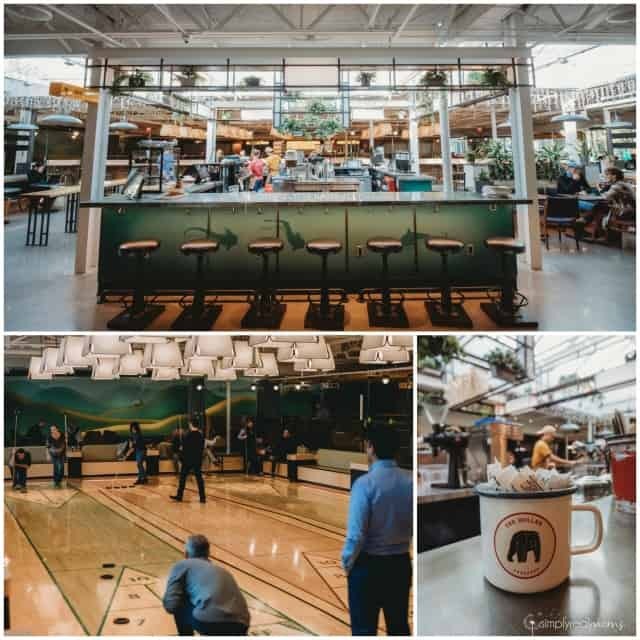 Airship is also brewed inside of the Holler, another great spot to grab a coffee and meet with friends for shuffleboard, work or even hold a meeting! Bentonville is quickly becoming a hub for biking. Whether you like a leisurely ride along the miles of paths around town or are more of a thrill seeking mountain biker, Bentonville has you covered! They promote a bicycle friendly culture for both residents and tourists alike and I’m not kidding when I say that I’ve never seen so many people biking around. The trails are easily accessible from the downtown area and are surrounded by beautiful art and trees along the way. Click HERE more info on the trails in Bentonville. Like I said, Bentonville has a vintage charm that you just don’t find anymore. It’s such a sweet town but not so sweet that it makes you sick…it’s just comfortable. You immediately feel at home and like you could stay for any length of time. One of the men working at our hotel mentioned that he came for vacation and moved there a month later because of how comfortable he felt. It’s just the perfect balance of old and new with all kinds of amazing development in the works. You can’t really talk about Bentonville without any mention of Walmart. The Walton family began the Walmart empire in Bentonville and the influence is seen all over town. 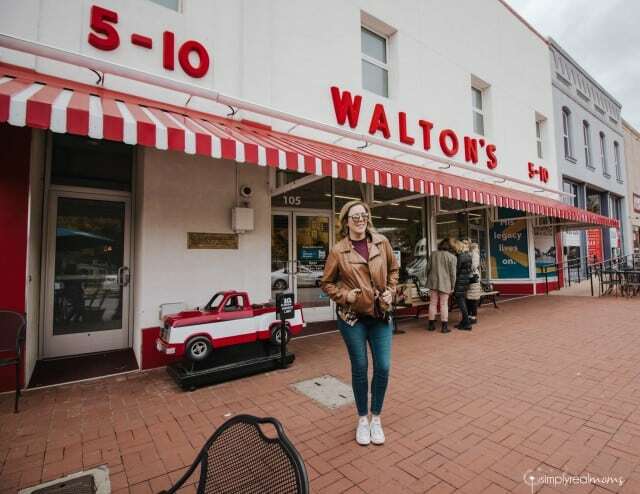 There is a Walmart museum with the history of the stores and the Walton’s in Bentonville, there’s a Walton’s 5 and dime with the most adorable nostalgic toys, trinkets and candies and an old fashioned soda fountain and ice cream shop all right on the main square! Make a point to go into the Walmart Market in downtown. You’ll be thoroughly impressed by how different it is from your typical Walmart store! The people in Bentonville are welcoming, warm and love their town so much. They take pride in the Northwest Arkansas region and love the Razorbacks with a passion. We met people from all walks of life and from all over the country who have come to Bentonville for a better quality of life. Southern sweetness is alive and well in Bentonville and every other word you hear is “y’all”. It’s contagious too! It’s hard to be in a bad mood when everyone around you is joyful and kind. There’s so much to do while visiting Bentonville! As a mom, my favorite has to be the Amazeum. My kids and I are members of our local children’s museum and love to visit local museums when we travel so checking out the Amazeum solidified my want to bring my kids back to Arkansas. 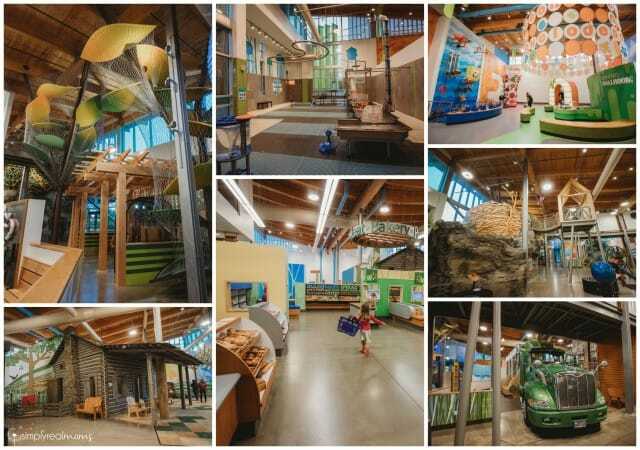 The Amazeum is one of the best children’s museums I have visited, filled with the perfect balance of education and fun all in one spot. It’s a must when visiting with children. 8th Street Market is another great spot to check out. It has a little bit of everything! 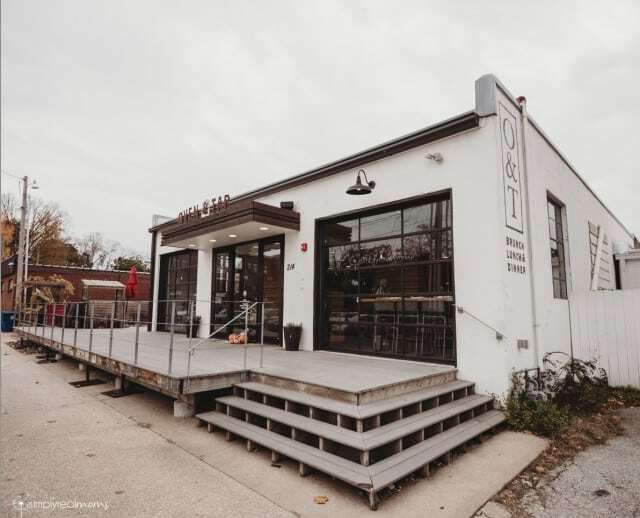 There are food trucks parked outside with delicious offerings, Markham + Fitz and their famous cookies are in the market, Bike Rack Brewing is there, Yeyos is a popular Mexican restaurant located there and the Holler is at the center of it all. The Holler is a social spot that has coffee, food and a bar all in one. It’s open from early morning until last call late at night, and everyone from business folk to college students come to work, hang out and play some serious shuffleboard. I wish we had a spot like this local to me, I’d work there all the time! After having dinner at the Preacher’s Son, take the stairs down to the basement and head into the coat closet. In there you’ll find a hidden speakeasy called the Under Croft that is a great low-key lounge and the perfect spot to meet friends or finish up a date night. The bartenders in the Under Croft all have their own signature drinks and while it can get busy, it never felt crowded because the seating is all very private and cozy! Where should you stay while in town? I stayed at the Four Points and was very happy with all of the amenities and the quality of the room, and the location was a quick ride away from downtown. If you prefer to be in the middle of the action (so to speak), Hotel 21C in the heart of downtown may be more up your alley. Bentonville is a destination not to be missed! 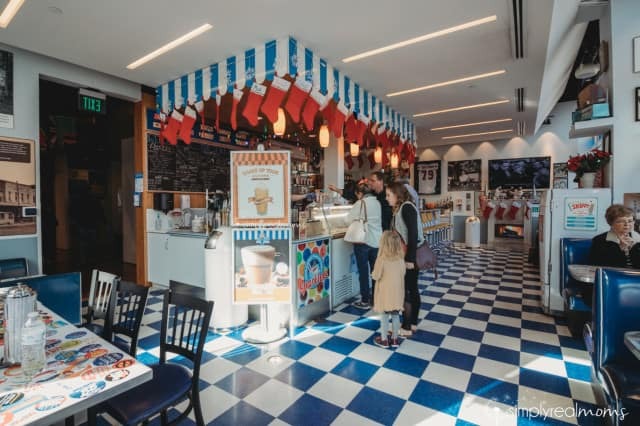 I loved my stay in Bentonville and not only am I planning a visit back with my family, we even took a look at real estate in the area because I fell in love with this beautiful town. You can find more information about Bentonville and planning your own visit HERE. 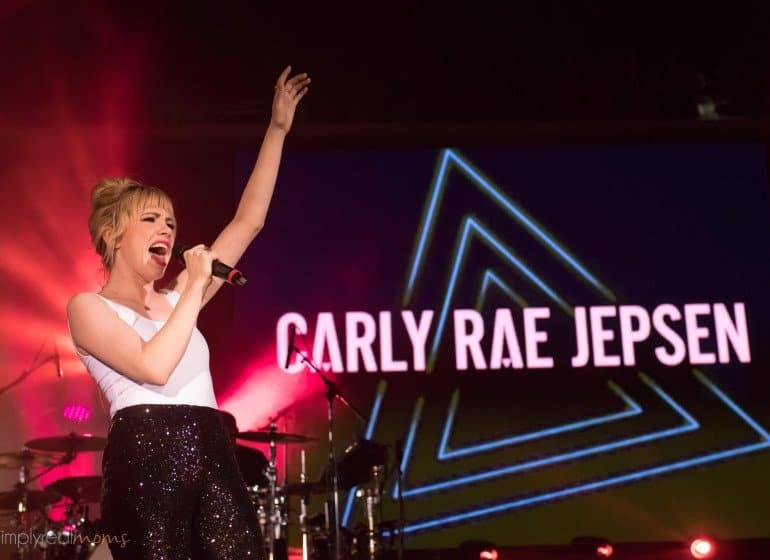 *This article is sponsored by Visit Bentonville and all of our travel accommodations were hosted but all opinions are our own. Please stop telling people about us ;). We need to stay a hidden gem.